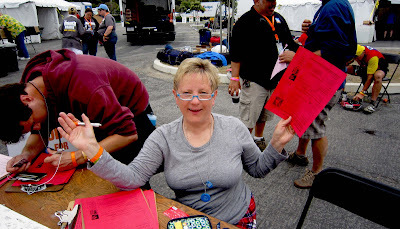 If you've been trying to contact me this week, you've heard a telephone recording saying that I have been away, working as a "roadie" for the 10th AIDS Lifecycle bicycle ride from San Francisco to Los Angeles. Hundreds of bicyclists and roadies (their support team) traveled 543 miles in seven days. My job, in the camp store, included recruiting participants for next year's fund-raising ride. I signed up over a 1000 brave and determined folks. This year's ride raised over $13,000,000 for the Jeffrey Goodman clinic that serves the greater Los Angeles area, including the San Fernando Valley. Hundreds of Valley residents ride or work as the crew for the Ride. 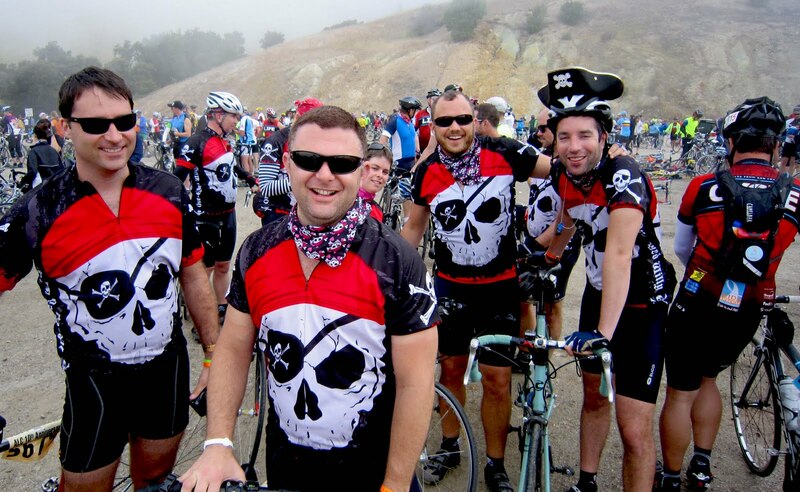 The Ride also supports the San Francisco AIDS Foundation that, like the Goodman Clinic has saved thousands of lives. 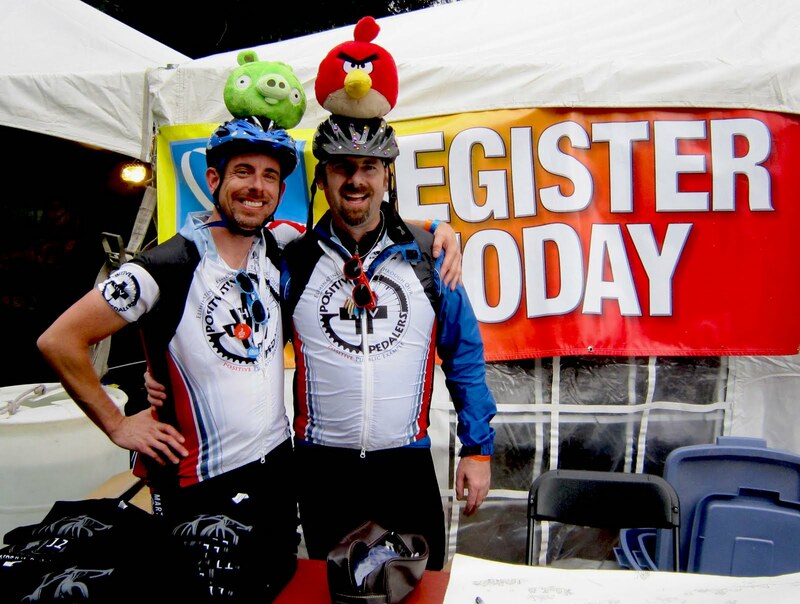 2,350 riders and 650 roadies! Many riders belong to training teams. This group called The Pirates relax at a foggy half way site on their way to Southern California. at the place where they registered for AIDS Lifecycle 11 next year. This woman was the 1000th person to sign up for next year's ride at Jerry's station at the camp store. The entire camp was set up and taken down and transported to its next site every day during the Ride. It has become important to the retention and redefinition of identity and community among Oaxacan transnational migrants who currently reside in the greater Los Angeles area and play the game in the San Fernando Valley. Free Admission. 4/27/19 Special Event - Scott Tracy Griffin of Edgar Rice Burroughs, Inc. will speak on life of Edgar Rice Burroughs and the centennial of Tarzana Ranch; 7:00 pm - 9:00 pm; $10/pp. Location, SFV Arts & Cultural Center, 18312 Oxnard St., Tarzana, CA 91356; Tel: 818.697.5525; info@sfvacc.org; www.sfvacc.org. 4/28/19 - Historic Walking Tour of Van Nuys; 2:00 - 3:30 pm; $10/pp; meet at: 6262 Van Nuys Blvd. Van Nuys 91401. Attendees will meet at 1:55 under the arch at Marvin Braude Constituent Center. Bring a friend to our tours. All groups and organizations welcome. 1) 50th anniversary of Apollo 11 and the moon landing. Artifacts, oral histories from general public and aerospace workers, speaker events, educational programming. For the entire family. 3) Tuna Canyon Detention Station - exhibit on what occurred from 1941-1943 regarding Japanese, Italian and German people at this location. 5/11/19 - PearlCon is an annual family, student-friendly and community comics and game convention featuring guest speakers, board games & collectibles card games, show & shine car show, food, prizes, talks, panels, demos, workshops, vendors, trivia contest, raffle, and a family friendly atmosphere. There is an added WWII theme headed up by our own teacher Franky Ortega. The Museum SFV will have a booth at event. 9:00 am - 3:00 pm; $5/person. School fundraiser. 6649 Balboa Blvd.Lake Balboa, CA 91406; Tel: (818) 654-3775. 5/19/19 -Annual Artifact Day and Speaker Series at The Museum SFV. Come on out and show and tell an artifact related to the history, art and culture of the valley. Speaker on history of objects and artifacts. Family fun day too! 12:00 - 4:00 pm. Car show, arts and crafts and educational programming. Free admission. Donations appreciated. Fee for food truck & ice cream treats offered by Handel's Ice Cream of Northridge. 5/26/19 - Historic Walking Tour of North Hollywood; 2:00 - 3:30 pm; $10/pp; meet at: 5211 Tujunga Ave., North Hollywood, 91601. Attendees will meet at 1:55 at NW corner of NoHo Regional Library at Amelia Earhart statue. 6/23/19 - Historic Walking Tour of Van Nuys; 2:00 - 3:30 pm; $10/pp; meet at: 6262 Van Nuys Blvd. Van Nuys 91401. Attendees will meet at 1:55 under the arch at Marvin Braude Constituent Center. Bring a friend to our tours. All groups and organizations welcome. Visit Museum of the San Fernando Valley's profile on Pinterest. MARC WANAMAKER'S NEW BOOK "SAN FERNANDO VALLEY"
2015 The Museum of the San Fernando Valley. Simple theme. Theme images by richcano. Powered by Blogger.